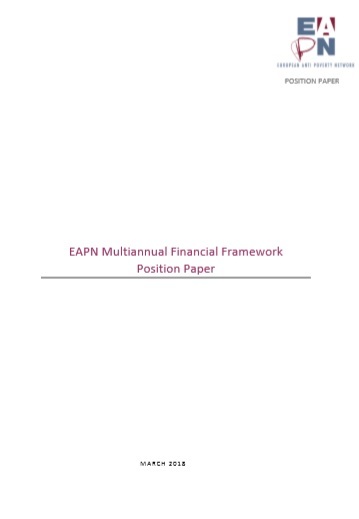 The Multiannual Financial Framework (MFF) is the tool through which the rules for the formation of the European Union budget are defined, and which has been used to address the challenges that have confronted the Union over the years; the MFF review tool should also serve to anticipate the issues that will have to be addressed in the years to come, including on the basis of the choices that will be made by the European Council on the scenarios for the future of Europe. The current debate on the MFF takes place at a time when, following the long depression due to the financial and “social” crisis of the last 10 years, a recovery is expected to be able to improve the conditions of Europeans, but has yet to do so for many. It also comes in the context of Agenda 2030 and the Sustainable Development Goals (SDGs), the Europe 2020 Strategy and the debate on its successor (particularly the target on reducing poverty) and the recent adoption of the European Pillar of Social Rights. Data tells us that the situation of citizens, particularly in relation to poverty, has deteriorated. This paper sets out key messages in terms of the MFF’s contribution to the fight against poverty, exclusion and inequality, and details 3 propositions to ensure that the fight against poverty is central to the EU’s policies & priorities.